There was so much to do and so little time to do it. I tried to make pages for the main things I did, but a few activities really didn't fit anywhere else, so they'll be here. Specifically, a harbor cruise and some fine places to dine. 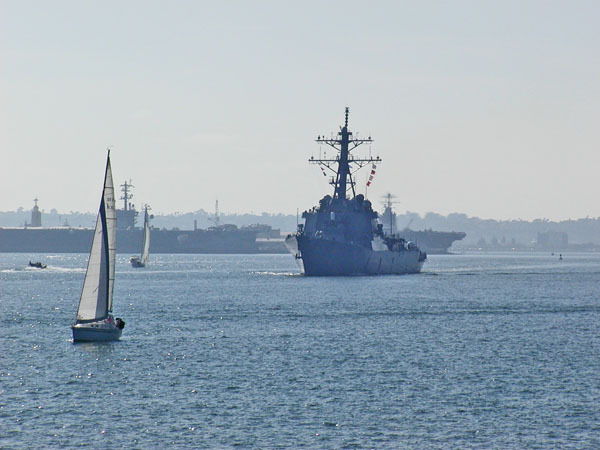 Of course, there is a large naval base at San Diego. The ships which call this place home include four aircraft carriers. Below is one of them -- the Stennis. 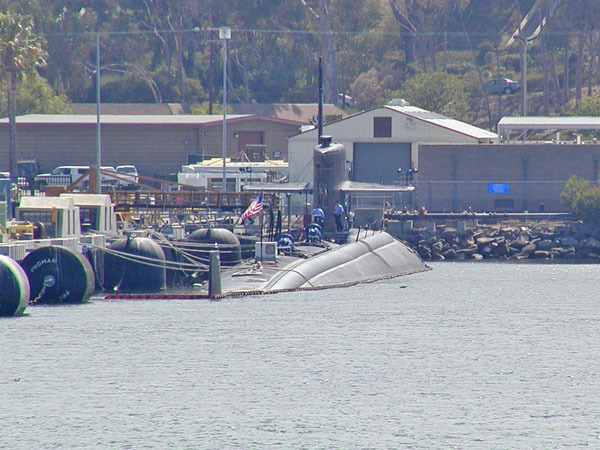 Submarines are based here as well. Several were in port this day. During our tour, this destroyer returned to port. 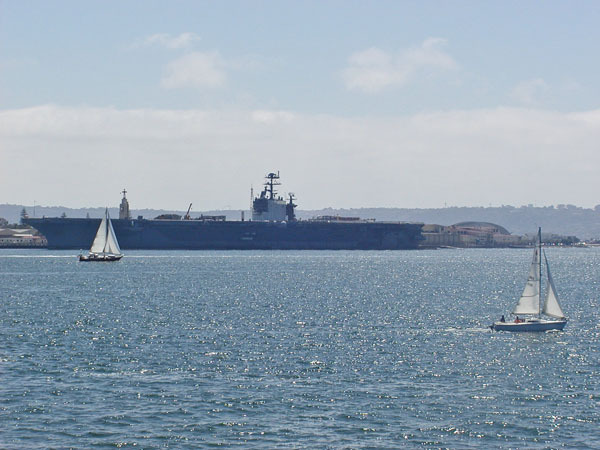 Other ships make San Diego home. 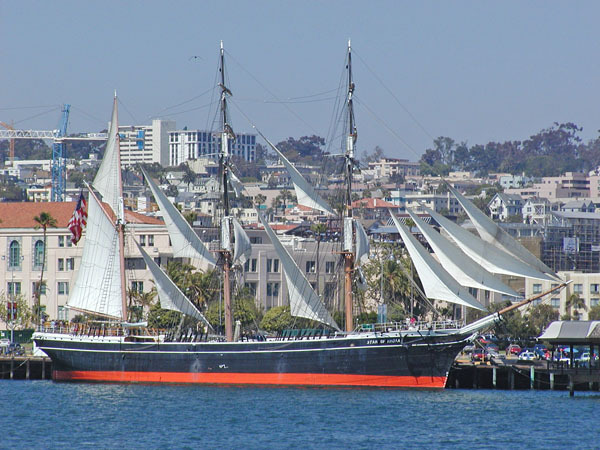 The Star of India is the oldest merchant sailing vessel still in operation. It is docked at the Maritime Museum at the harbor. 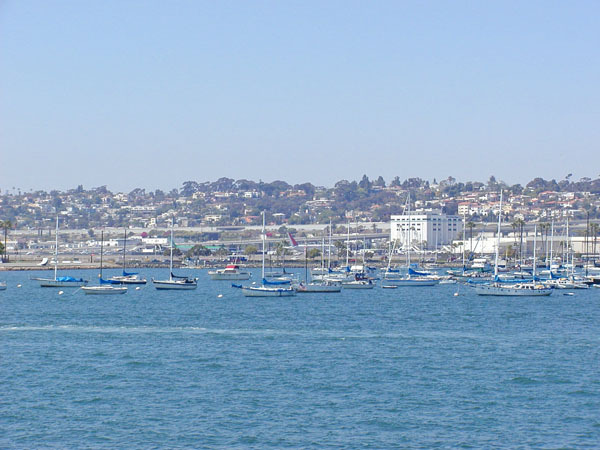 San Diego is a popular harbor for small boats too. Boats aren't the only things to "dock" in the harbor. 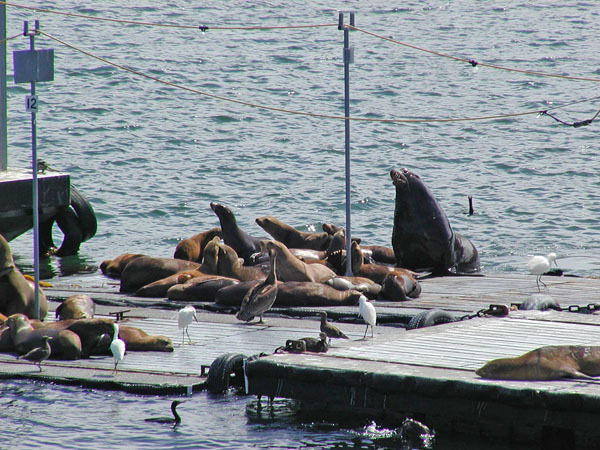 These seals and sea lions were waiting on some free food from a nearby bait-fish house. 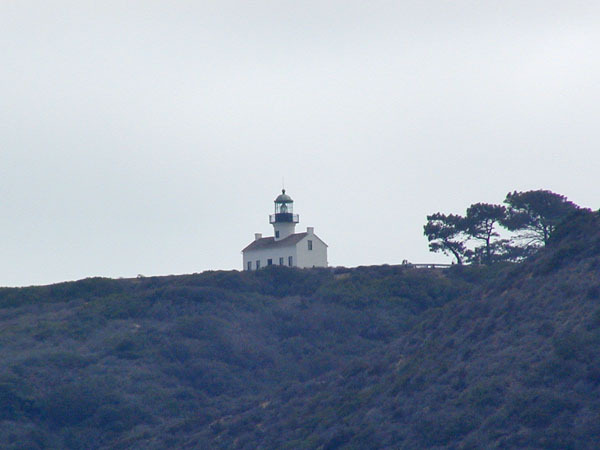 Below is the light house for the harbor. 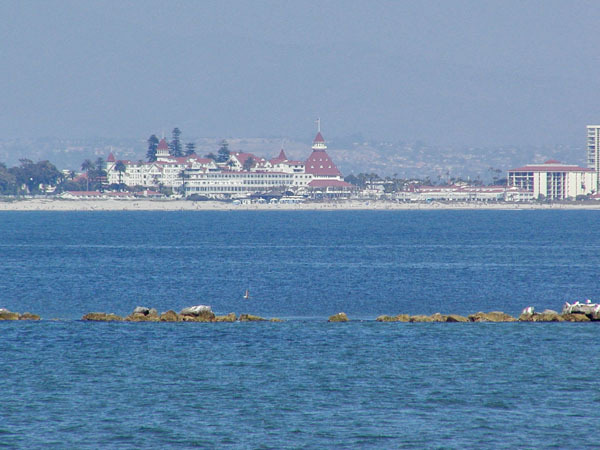 It seems like no matter where you are around Coronado, you can always find the Hotel del Coronado. Here are a few of the places we ate on our trip. 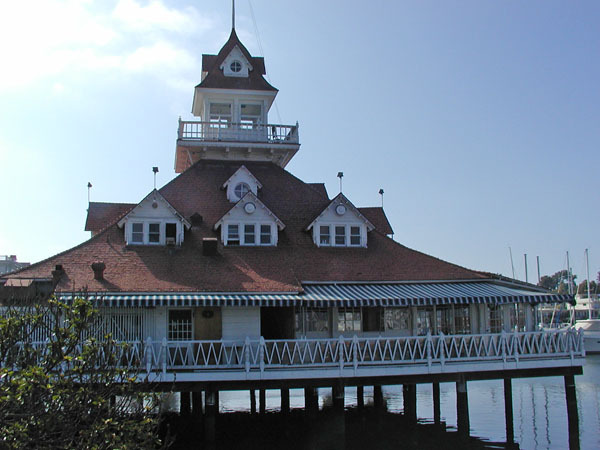 The first evening we were in town, we had to eat someplace close to where we were taking our "sunset sailing cruise" (see the Hotel del Coronado page for more information and pictures), so we decided to eat at the Boat House restaurant right beside the dock where the sailboat was docked. The coconut shrimp "appetizer" was enough for a whole meal! And pretty tasty too. The second night in town, we went for something in Coronado and had pizza at a little place (no picture) near the hotel. The third night we followed a recommendation (thanks, Cindi!) 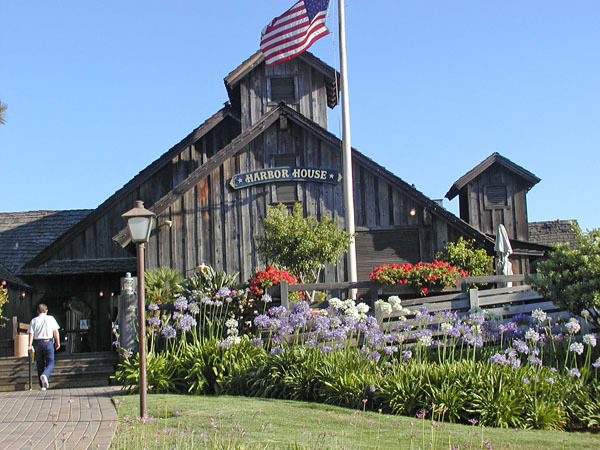 and went to the Harbor House restaurant (left) on the San Diego harbor in Seaport Village. This was pretty nice too. The fourth night was Mexican food at a place in Coronado (I don't recall the name right now, but avoid the "fish tacos"). 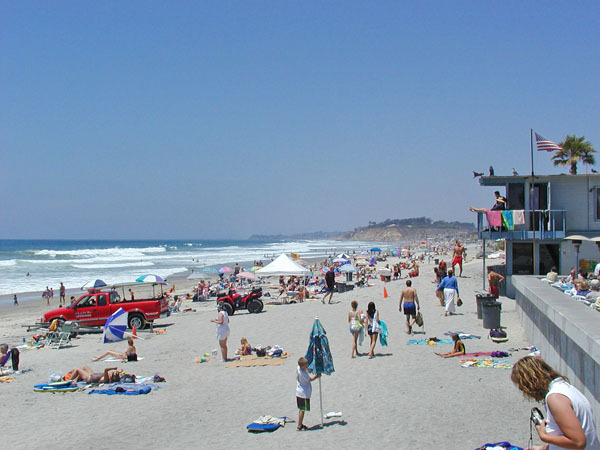 The fifth day we spent the morning in La Jolla and Del Mar, but we followed Cindi's recommendation again and ate at the Poseidon. 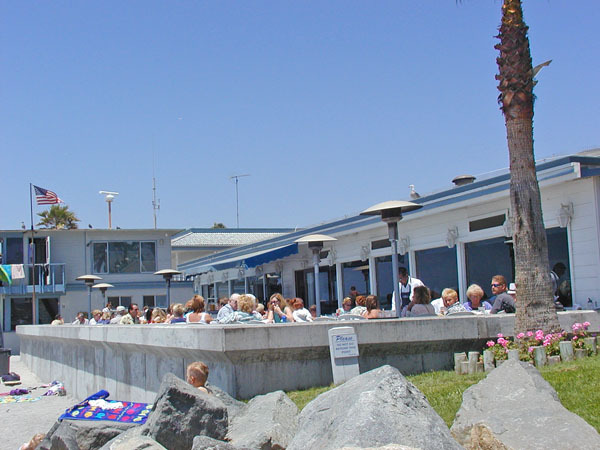 Below is the outdoor dining area -- it is right next to the beach. 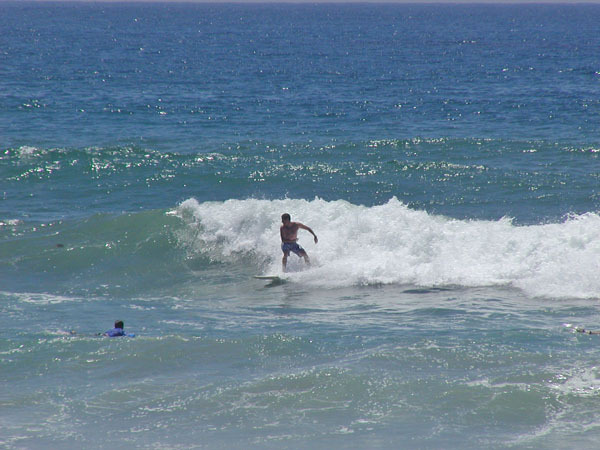 At the Poseidon, you can eat and watch surfers. 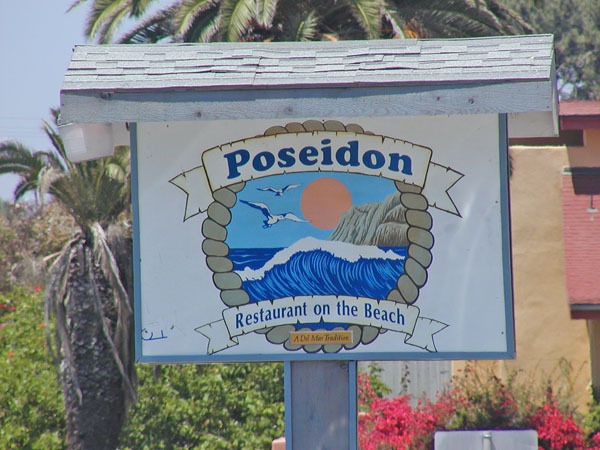 Of all the wonderful places we ate, one of the favorites was our last place to dine. 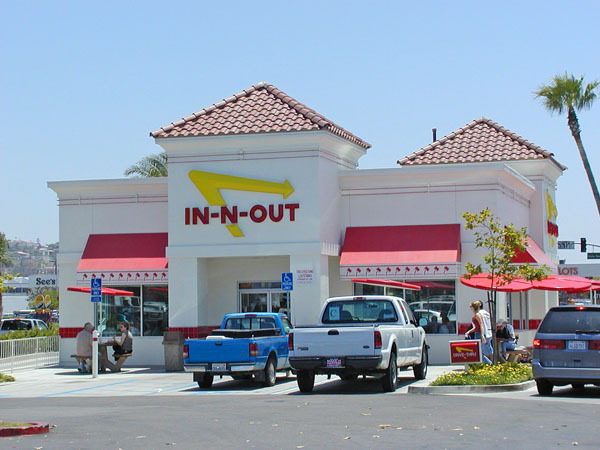 On our way to the airport to fly back, we followed Cindi's recommendation again and ate at the In-N-Out Burger. They have only three main items on the menu: hamburger, cheeseburger and double-double cheeseburger. They claim not to have freezers -- they make everything fresh. We saw them putting peeled potatoes into a slicing machine to cut them for french fries. Everything was fantastic! We can't wait for them to open a franchise in Fort Worth.